It seems like there are two primary printing methods that dominate the imprintables market: DTG (Direct-to-Garment) Printing and Screen Printing. DTG is a newer method of printing in which a printer applies ink directly to the shirt (just like your printer at home, except it prints on fabric instead of paper). 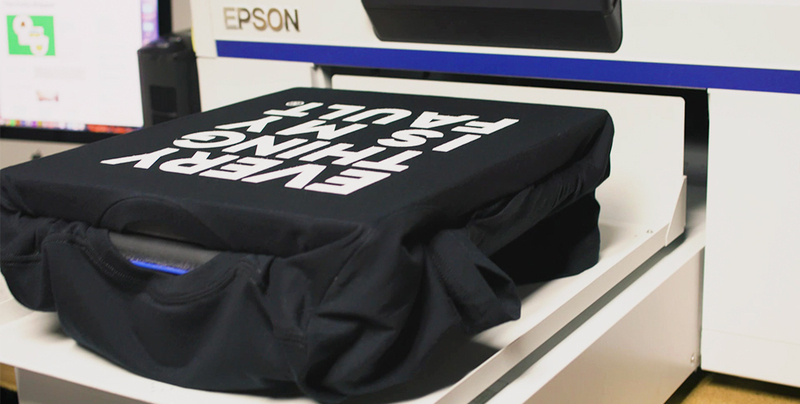 We sat down with Family Industries, a downtown LA-based printshop that offers both DTG and Screen Printing to go through some of the most common questions asked about DTG printing. Check out the video below or read for the full story! Question: What’s the best shirt to DTG print on? 100% cotton is the best for DTG printing because cotton is a natural fiber that absorbs the water based ink used in DTG printers, but not all cotton performs the same. With DTG, it’s important you choose a shirt with as smooth a surface as possible so you don’t get stray fibers affecting the print. Avoid any carded open end or C.O.E. cotton–these are those heavy, scratchy, cheap tees. Check out a recent post we did comparing how different types of cotton print with DTG. It is possible to print on fabrics like our triblends, heathers and flowy, but it takes a lot of testing for a print shop to get the settings right. If you want to do DTG printing on fabrics other than 100% just make sure that you work with a print shop that is experienced with the type of blend you want to print. For more on DTG printing on blends, check out this post. Question: When is it best time to use DTG printing? Your artwork has a lot of colors. This can be expensive to achieve with screen printing unless you are doing really large quantities. If you want to do a small run of a graphic with a lot of colors (like a photograph for instance), you’ll definitely save money by printing the job with DTG. With screen printing, ever color in your artwork needs to be burned into a screen, taking time and money. You don’t have to worry about the number of colors with DTG. You are doing one-off-printing or fulfillment. If you have an e-commerce platform and don’t want to hold inventory, you will want to look into fulfillment printing. Companies like Family Industries can connect to your website’s API and fulfill orders as they are placed by your customers. In this case, DTG is the best method because every print is a one-off. You have a small quantity rush job. When you are printing small quantities, DTG is usually faster than screen printing because there is no production set up. With DTG, your printer won’t have to burn screens or mix ink. They just load a shirt and print. You need a sample. DTG is great for sampling styles before doing a full production run. If you decide to do a big run of a certain piece, you can then switch to screen printing. Question: What’s the difference in pricing for DTG vs screen printing? There is usually a higher per unit cost with DTG but is going to be more affordable when you are doing small runs or fulfillment printing. Pricing will vary printer to printer, but you can expect to pay around $12 – $14 for a DTG print. A good rule of thumb, when reselling, is to try and double your margin. The great thing about BELLA+CANVAS is they are retail quality tees in terms of fabric and fit, so you can easily sell them for around $30. Question: Any tips to keep in mind for artwork? The main thing to keep in mind is that your colors might not come out exactly as expected. Different fabrics and colors take ink differently and there are a lot of variables with the settings that can affect the output color. If matching the exact Pantone of your artwork is super important to you, this can be achieved with DTG. You just need work with your printer to test and figure out the right settings to achieve an exact shade, so it might take more time on the front end. Color vibrancy is something you should definitely look out for with DTG since tweaking the settings can sometimes be an easy fix for your printer. Question: How does a DTG print hold up after washing? When you first receive a shirt with a DTG print, it’s going to have a bit of shine from the pre-treat. After the first wash, when the pre-treat comes off, the print will look more natural and the “waxy” appearance will disappear. DTG should hold up just as well as a screen print if it’s done correctly. If a DTG print deteriorates after a wash, it was most likely not pre-treated or cured correctly. Talk to your printer if you experience this issue. If Bella + Canvas T’s are so great for DTG, why does Bella + Canvas refuse to wholesale to DTG shops? If someone could explain that one to me I’d appreciate it. Hi Steve, We do in fact sell to DTG shops! Are you an owner of a DTG shop? Please reach out to us at sales@bellacanvas.com and we can get you what you need. Thanks!